Our restaurant offers a wide array of authentic Asian Food, such as Sushi, Yellow/Red (spicy) Curry,Hibachi, Teriyaki, Tempura, Thai Basil Fried Rice, Coconut Shrimp, Seafood Delight General Tso's Chicken, & etc. Try our delicious food and service today. Come in for an Asian Lunch Special or during evenings for a delicious Asian style dinner. NOTE: Kevin Xaio is no longer a partner in the business. It was Kevin Xaio's cousin who suggested the young chef open a restaurant in Batavia. Xaio, who lived and worked in New York City, tried to find out all he could about Batavia and the local restaurant market, Xaio said. "It's six hours," Xaio said, "I drive here more than 10 times. I check out everything. Other businesses, Applebee's, dine-in restaurants, how are they doing, and how is traffic, how is the casino. I check all and the past history and see that the people here are nice and I think with the traffic here we're going to have a nice business." A little more than a week ago, Xaio, and his partner, Chris Huang, opened Yume Asian Bistro at 4140 Veterans Memorial Drive. An article in The Batavian helped alert local sushi aficionados to Xaio's and Huang's plans and the business is off to a good start. "It's amazing," said Xaio with a broad smile. He smiles often when talking about his new business. And he's most pleased that many customers have already been back three times within a week, trying something different on the menu with each visit. There are a few facts to correct from that original article, which was based on a conversation at a public meeting that neither Xaio nor Huang attended. Xaio doesn't own any restaurants in NYC. Neither he nor Huang are planning to return to NYC (Huang moved here from New Jersey, not NYC). They've both taken up residence in Batavia and both work at the restaurant full-time with no plans to leave. Xaio grew up in a small town in Missouri, near St. Louis, which is part of the reason he liked Batavia as a possible location for his dream restaurant. "The location is good and the people are nice," Xaio said. "That is the most important. It is country-sized. I'm from country-sized." Xaio's father has been a chef for 30 years and Xaio started working in the kitchen at 16 years old and has been a chef now for 10 years. When he talked with a cousin, who lives in Batavia, about his ambition to open his own restaurant, his cousin told him Batavia had only three Chinese restaurants, no other Asian cuisine and no sushi. "At first, I didn't think sushi would be good for people here, but I hang around and I ask people, do you like sushi and they say yeah, I do, but I need to drive 30 or 35 minutes to Rochester or Buffalo to get it," Xaio said. "Then I think, I need a sushi bar here, and alcohol, that's what I think." Yume doesn't have its liquor license yet, but the blue-lit bar in back has three wide, empty shelves, and it's looking thirsty for clear glass and amber and green bottles of whiskey, scotch, gin, vodka and other spirits. Huang is the sushi chef. He's been preparing sushi for 10 years. He became a popular sushi chef in New Jersey, Xaio said. "When Chris started in a restaurant there, it is low business, right, but after Chris there, it is high," Xaio said. "The business is growing because of Chris." Huang's English is not as good as Xaio's, so he answers questions in just a few words. He said people should eat sushi because it's healthy. "It's good for the body," he said. Huang's sushi speaks for itself. There is an art to making sushi. It's about blending flavors, colors, shapes and dimensions on plates that are as pleasing to the eye as to the palate. Batavia resident Michael Robbins is one of those customers who has already returned at least three times since the restaurant opened. Part of the appeal is that the menu contains rolls he's never tried before, such as the marble roll and the Godzilla roll. He has primarily come back, though, because of the flavor and freshness of the fish. He's also impressed by the presentation, he said. "It's really all about taste, but it's nice that they put such detail in it, because to me, if they're putting out a great presentation, it shows a lot of care," Robbins said. "It shows they care a lot about what they're doing. That's the thing that impresses me is they care a lot about what they're doing. That's what the presentation means to me. 'We worked hard on this for you.' "
Robbins and his wife have regularly driven to Buffalo for sushi and they were excited that Yume was opening across from Walmart. "We kept checking and checking and it opened, and my wife and I said 'Ok it's open. Let's go.' And it was really enjoyable experience." The sushi hits another sweet spot for Robbins. It's affordable and Huang serves up hearty rolls with plenty of fish. Robbins is saving the expense of a trip to Buffalo, he said, and he's not paying as much for the same quality. "It's a big lump of fish mixed with a lot of good ingredients and there's plenty of it," Robbins said. "When you buy a roll you want to be filled up after you pay for the roll. A lot of times when you buy a roll somewhere else and it's not packed with sushi, it's not going to fill you up." Jeff McIntire brought his family into the bistro for the first time Friday night and his three children seemed as to be excited to be there as he was. There was Derek 12, Kayla 11, and Randy, 8. Soon after the children were seated at a table, they headed over to the sushi bar and clambered up on three chairs where they could watch Huang and his assistants work their magic on gorgeous creations of fish, rice and vegetables. Derek and Randy are more the California Roll-type sushi diners, but Kayla has already expanded her options, McIntire said. Asked if she loved sushi, Kayla's eyes got big, she grinned and we learned that sometimes the word "yes" contains more than three letters. A former Marine, McIntire was deployed in Japan a few times, but never tried sushi in its country of origin. It wasn't until he was stationed in California that he ate sushi for the first time. He started, as many neophytes do, with the California Roll. Sushi was first introduced in the United States in Los Angeles in the 1960s. Chef Ichiro Mashita, at the Tokyo Kaikan restaurant, is credited with developing the California Roll by trying to incorporate avocado into a roll. A California Roll is comprised of cucumber, crab meat and avocado (though there are variations). It's become a popular dish in the United States, though scorned in Japan. But it's a place to start, McIntire acknowledged, especially for his children. You can work your way up to raw fish. When you know sushi, you know what good sushi is, Robbins said. He compared it to the kind of hamburger you get at a place like Fudrucker's to what you might expect from a drive-thru joint. One is a meal made from fresh, quality ingredients, and the other is just thrown together for quick consumption. An ironic comparison since sushi is kind of the original fast food. Sushi as we know it today was invented, most likely, by Hanaya Yohei near the end of Japan's Edo period (roughly the 1860s). He created a meal that could be made quickly with inexpensive ingredients and eaten by hand (no chopsticks required) by people on the go. When the government outlawed sushi street vendors, the cooks moved indoors into restaurants and became chefs and sushi evolved into an art form. Though sushi has become popular in this country -- seemingly passing the trend stage many years ago and skirting the edge of mainstream -- Americans often eat sushi all wrong according to some. To understand how to eat sushi, it helps to understand what it is and how it's made. The key ingredient is vinegared rice. It is Japanese rice mixed with a dressing of rice vinegar, sugar and salt. Sometimes a wrapper is used. The wrapper is usually a kind of seaweed that has been dried, compressed and rolled paper thin. We generally think of sushi as raw fish, and while that might be the heart of the sushi experience, main ingredients can also be a variety of cooked meats -- octopus, squid and shellfish are always cooked -- or vegetables. When you get your plate of sushi, it will likely contain a dab of wasabi (a green paste similar in taste to horseradish). There will also be an empty dish where you might pour a little soy sauce. You may also receive a dish of pickled sliced ginger, which acts as a palate cleanser between bites, the way a wine connoisseur might use crackers between tastings. 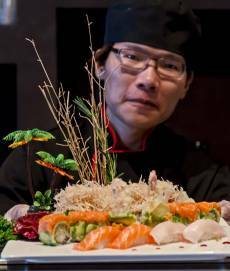 For a visitor to Yume Asian Bistro on Thursday, one of the sushi chefs, Jerry Zhao, explained the dishes and how to eat them. Starting with a type of sushi called nigirizushi -- an oblong, hand-pressed serving of rice and a cut of raw fish placed on top -- Zhao said there are a few options on how to eat it. In Japan, it would probably be eaten as presented, with no soy sauce, no added wasabi (the chef has already placed some wasabi under the fish). It's traditional to use your fingers to pick up nigirizushi, but chopsticks are acceptable. Americans, typically, will place some soy sauce in a dish and mix in a dash of wasabi, Zhao explained. Some might put a dab or three of wasabi on top of the fish. What's more important than how you use wasabi, or whether you grab the serving with your fingers or chopsticks, is what you do next. What you don't want to do is try to cut the fish or let the rice touch the soy sauce (the rice will soak up too much soy sauce, destroying the flavor of both the rice and the fish, and cause the packed rice to fall apart). Rather, you turn the nigirizushi-fish-side first into the soy sauce. Just a dab will do it. You then put the whole piece into your mouth, fish side on your tongue. For a roll, you would likely not dip it in your wasabi-soy-sauce mix. 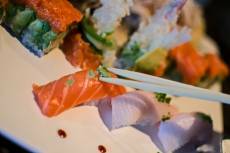 For traditionalists, they eat sushi as served, and it's chef's choice, not the diner's. In Japanese, "trust the chef" translates into "omakase." In some sushi bars, diners have no other choice. At Yume Asian Bistro, of course, the choices are much more expansive. There is a menu loaded with an array of sushi choices, such as chirashi, sashimi, spicy maki, eel dragon roll, thunder roll, Mexican roll and naruto maki. Sushi can also be ordered a la carte. While Huang runs the sushi bar, Xaio is in charge in the kitchen, which provides both additional Asian flavors to experience, but also gives the person not ready to try sushi meal options while the rest of their party may be in the mood for some raw yellowfin tuna or striped bass. Xaio's kitchen is well equipped with all-new restaurant-quality ovens, burners and grills and he has plenty of helping hands to aid in fast and accurate meal preparation. 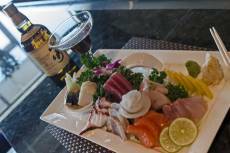 Yume's kitchen menu includes teriyaki, hibachi, and tempura dishes. 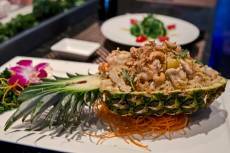 Entrees include pad thai, curries, salt and pepper shrimp, duck, and pineapple chicken. Xaio admits to being a little unsure yet what Batavia's diners would prefer on the kitchen menu, so he will run regular specials to find out what people like. "I know how to cook a lot of stuff, but I don't know if people like it or lot," he said. He's also brimming with ideas. "I have so many things on my mind to put on the menu, but I can't do it all at once, so I try maybe (to) switch menus, a summer menu, maybe," Xaio said. Everything that is served out of the kitchen is prepared with the same eye toward presentation as the sushi. Great care is taken to ensure dishes are as artful as they are flavorful. A customer favorite already is Xaio's pineapple fried rice, which is rice, shrimp, chicken and bits of pineapple served in half a pineapple husk. Xaio and Huang put a great deal of thought into designing the interior of their restaurant, as well. A spare, contemporary theme of cut rocks along the walls sets the tone, with touches of Asian art. The predominant feature is water flowing through two panes of thick glass near the entry. The chairs and booths are covered in leather and Xaio said he picked seating with extra padding to ensure customers are comfortable. The lighting is kept low so those who want a romantic atmosphere will find it at Yume. The light across the room is actually gradiated. More light near the bar, where people can socialize, less light along the far wall; seating in the back is arranged for couples. "I feel when people are eating, they need a comfortable place," Xaio said. "Music, good food and a comfortable place." It took a lot of work to get his dream restaurant open, but now that he's serving food to happy customers, Xaio is glad to see the effort paying off. "We try (the) best we can do," Xaio said. "Seven months. That is long story. I was just trying to do things perfect." So far, it seems the customers like Batavia's new Asian bistro and Robbins thinks more local residents need to try Yume, and they should try sushi. "Life is about trying different things," Robbins said. "You have to try different things, right? Why have the same old thing all the time. Like traveling around the world and going to different places, and it should be the same thing when you eat. You should try different things to see if you like it. You might surprise yourself." Yume Asian Bistro has the most artistically beautiful plates of food coming out of their kitchen! The food is always fresh and delicious. Definitely a neighborhood favorite for me! Yume introduced me to sushi and it has become one of my favorite places to dine. It's truly a unique experience and a great place to share a meal with friends. This place is fantastic! If you are looking for quality Asian food in a relaxing atmosphere, check this place out. Oh, if you don't know how to eat with chopsticks, better ask for silverware!